This Wednesday, May 10 2017, I will be reading with Kimmy Beach as she launches her latest book, Nuala at Shelf Life Books. CLICK HERE for event details. BALANCE: The year 2012 will mark the 14th National Poetry Month across Canada, offering us the opportunity to create another new, exciting theme: Balance: Cultural, Creative, Community, National, Environmental, Economic, Personal, and Social. Participants will be asked to expand on this theme, offering their view on what balance means to them, on a personal or even political level. How is balance achieved in our communities? How do we create and ensure balance in our ecological system? How can Canadians balance creative and cultural pursuits within the current political and economic environment? How do you achieve balance at work and at play? Celebrating the 14th Annual National Poetry Month, four talented Calgary area poets will share their perspective on this year’s theme of “balance” – culturally, creatively, linguistically, personally, socially, playfully, politically, poetically, or perhaps even musically! Vivian Hansen is a Calgary poet and activist. She has run poetry workshops for the John Howard Society/Inn From the Cold Literacy initiatives. Her fiction and nonfiction has appeared in many anthologies, most recently in The Madwoman in the Academy and Writing the Terrain. She has recently edited a collection of poetry entitled Rubbing-Stone: A Nose Hill Anthology, to be published by Passwords Enterprises in 2012. Her chapbook of poetry Never Call It Bird: the Melodies of Aids came out in 1998. Her first full-length book of poetry Leylines of My Flesh was published by Touchwood Press in 2002. In 2004, she published Angel Alley, a chapbook about the victims of Jack the Ripper. She has just completed her MFA in Creative Writing with the University of British Columbia. Richard Harrison is the author of 6 books of poetry, among them the Governor-General’s Award-nominated Big Breath of a Wish, poems about his daughter learning to speak, and Hero of the Play, the first book of poems launched at the Hockey Hall of Fame. 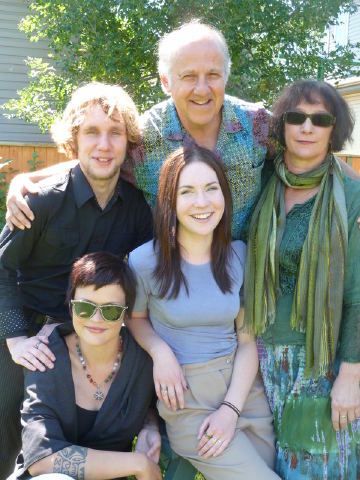 Big Breath won the City of Calgary Book Prize in 2000, and Hero of the Play went into a dozen reprintings before being re-released in a 10th Anniversary edition in 2004. Richard’s other books are Fathers Never Leave You (winner of the Milton Acorn Prize, Silver Medal), Recovering the Naked Man and Worthy of His Fall. Richard’s work has been published in journals in many countries, both in English and in translation Malahat Review (Canada), Greenfield Review (United States), and di Versos (Portugal). He has also given readings across the country and appeared on such programs as Adrienne Clarkson Presents and Peter Gzowski’s Morningside. Richard is also an accomplished editor, most recently bringing Frontenac House’s Quartet 2011 poetry books to press. He currently teaches English and Creative Writing at Calgary’s Mount Royal University and serves as mentor to an ongoing workshop for poets who themselves have gone on to publish widely in journals, anthologies and books over the past 10 years. Micheline Maylor recent publication “Starfish”, a chapbook with Rubicon Press, sold out in 2011. She became a recent graduate of the May Studio at the Banff Centre in 2010. She was named honourable mention in the UK’s 2007 Petra Kenny poetry awards. She has upcoming fiction and poetry in The Shyness Anthology, and Stampede Noir Anthology. Her latest works can be found in the Freshwater Pearls Anthology, Literary Mama, Numero Cinq, and the Literary Review of Canada. She attained a BA with honours at the University of Calgary in English, a Masters degree with distinction in creative writing at Lancaster in Northern England, and a Ph.D. at the University of Newcastle Upon Tyne in English Language and Literature with a specialisation in Creative Writing and 20th Century Canadian Literature. She has been the recipient of the Overseas Research Scholarship, the International Research Scholarship and Alberta Foundation for the Art grants. She has poetry published in over 50 journals in 5 countries. A certified poetry fanatic, she teaches creative writing, poetry, fiction, non-fiction, and composition at Mount Royal University. She also teaches various poetry workshops at the Alexandra Writer’s Centre Society, serves as its past President, and is the editor of FreeFall literary magazine. < www.freefallmagazine.ca >. Her first book is titled Full Depth: The Raymond Knister Poems (2007) and is available through Wolsak & Wynn < www.wolsakanswynn.ca >. 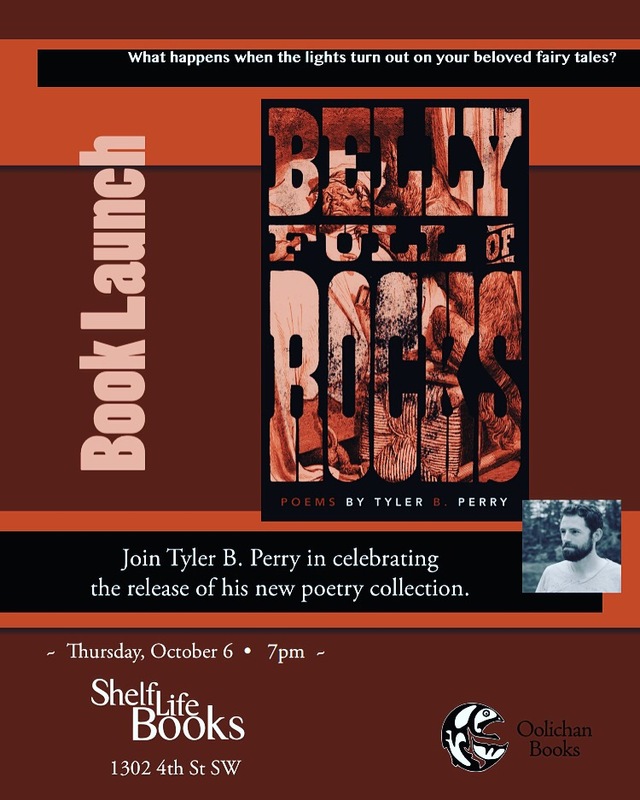 Tyler B. Perry works as a junior high teacher, and his first book of poetry, Lessons in Falling (2010, B House Publications), explores the world of school, drawing its inspiration from the events, personalities and physical surroundings he encounters in his daily work. Tyler is an active presence in Calgary’s poetry community, and along with a small group of poets, organizes and hosts the Ink Spot Collective monthly poetry slam. 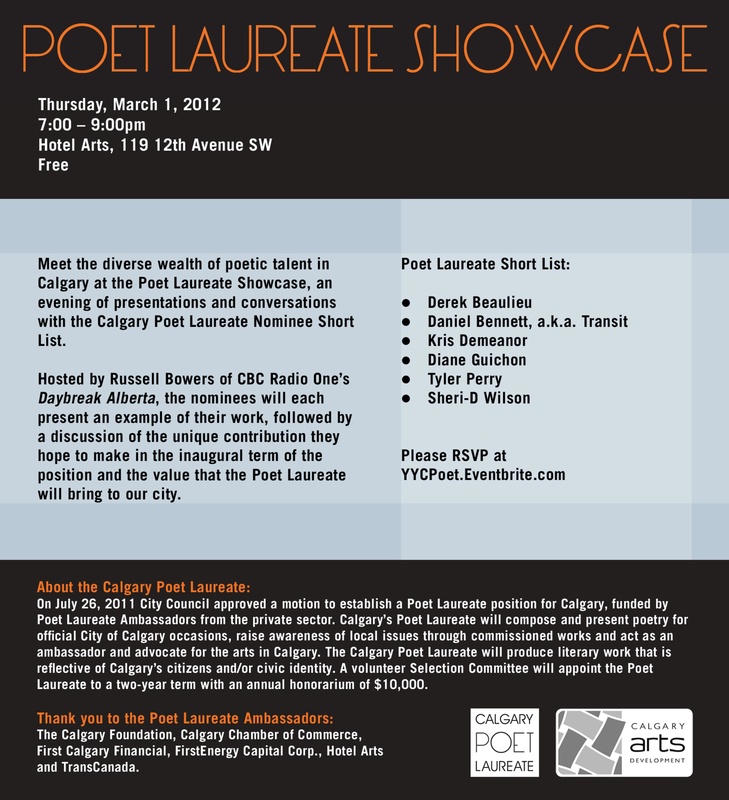 He was captain of the 2010 Calgary poetry slam team and has performed his work at venues across the city. Tyler is an MFA candidate at UBC and continues residing in Calgary with his wife and two young children. You can visit him on the web and read some of his poems at https://tbperry.com/. Unique local voices Rona Altrows, Rita Bozi, Ken Cameron, Tyler Perry and Rea Tarvydas present readings of poetry, plays, short stories and flash fiction. This is a free event so please RSVP to Rita Bozi as space is limited. We packed the house last year and added chairs! After the release of Key In Lock, Rona Altrows’s most recent collection of short stories, one reviewer said, “Rona Altrows is the first author since Chabon who repays a second read. Damn, she’s good.” Her previous book, A Run On Hose, won the City of Calgary W.O. Mitchell Book Prize. Rita Bozi is co-author of the Fringe hit play 52 Pick Up performed in 5 countries by over 15 theatre companies. Her travel essays have been published in FFWD Weekly. She is currently working on a collection of short stories called Hungry, High and Hammered, one of which was published in Pages of Stories. She is also writing Uprising, a novel chronicling her father’s escape from Hungary during the 1956 Revolution. An excerpt will be published in Page of Stories in fall of 2011. Ken Cameron’s hit play Harvest was recently published by Newest Press in Harvest and Other Plays. Bob Clark of the Calgary Herald called Harvest, “comic gold”. His newest project commissioned by the Blythe Festival is a musical about farming, cars and sleeping around, woven with the songs of Canadian alt-country star Fred Eaglesmith. Rea Tarvydas is a writer who has just completed her first collection of interconnected short stories called The Globe, two of which have been published in The New Quarterly and The Fiddlehead. She is currently marketing this collection, as well as an exciting anthology of literary noir stories called Stampede Noir of which Rea is co-editor. She is writing her first novel. After 12 months of intense competitions, the 2011 Calgary Slam Team has been formed and this is a benefit to help them get to the finals in Toronto next month! 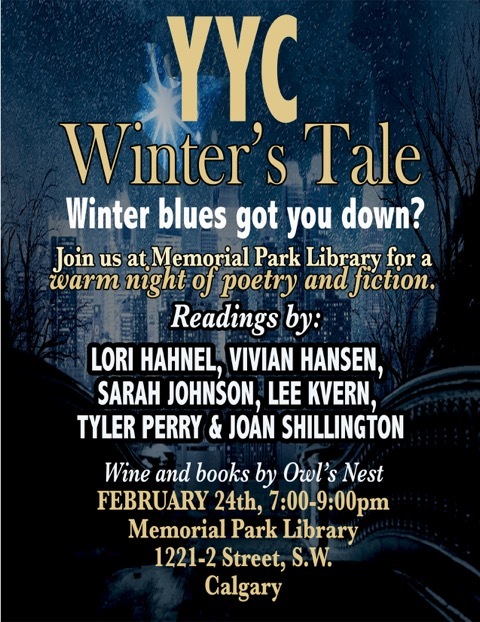 With Special Guest Readers: Joshua Bartolome, Tyler Perry, Eugene Stickland, Esau Tamura, Sheri-D Wilson, & local spinner DJ Sublight. There will also be a live auction featuring many local artists, writers, and businesses. All of the proceeds will be going to the Slam Team so please come out and Bid! Bid! Bid! Don’t forget the Open Mic will still be there for those who wish to get on stage! The Slam phenomenon has taken hold in Calgary and the audiences continue to grow exponentially. Hundreds of emerging poets have taken an interest in this fabulous new form. Swallow-a-Bicycle Theatre loves robots. Swallow-a-Bicycle’s next production, i-ROBOT Theatre, is full of robots. It’s inspired by a book of poetry called i-ROBOT Poetry, written by Jason Christie, which is also full of robots. This play about robots will be performed in a theatre called Birds & Stone from June 17-25. For more information, and for more robots, visitwww.swallowabicycle.com. Jocelyn Grosse‘s poems and/ or art work have appeared in Matrix magazine, filling Station, (orange) and NoD magazines. She is currently on the editorial collective for filling Station Magazine. She has performed her own work for Alberta’s South Country Fair, Theatre Junction’s Random Acts Festival (where her one act play, about a misguided animal rights activist, was nominated for an award for most “risk taking performance,”) at the Mutton Busting Performance/ Art Festival, and at the Calgary Blow-out Literary Festival. She is currently working on a book project for her son Alexander. Jocelyn volunteers as a wildlife rehabilitator as well, and brings her experiences with animals into her work. Nathan Thomas is a Calgary writer. He will be reading from a work entitled From the Depths which will be getting the graphic-novel treatment this year. Clagary Spoken WOrd Festival at the Auburn Saloon. View the footage below. Here is a link to some video footage of my very first poetry slam back in January 2010. My first poem begins at about 00:47:45 (just after Esau Tamura, a friend and colleague of mine), and my second is at 00:53:00, followed again by Esau Tamura. We went head-to-head in the final round. Also, at 00:04:55 there is a group performance by Esau, Evan Scurr and me. You know what, I completely forgot to get my copy signed. Still, I’m glad I met you and picked up your book, even if it did keep me up reading until 3am 😉 Thank you! I totally forgot to sign it. I guess we were too caught up in conversation. Great meeting you too though, Eric. I’m glad you enjoyed the poems. Thanks for the comment, and best of luck with your writing. I’m not sure if Tyler Perry knows everything a teenager is facing for he is writing only from what he sees. I suggest to go out and ask the kids who look like everything is fine what is happening in their lives. You would be surprised what students go through every day! The torment junior high brings and the feeling of being alone is present more than any happiness… I would know I’m one of those nameless kids kiddin behind the mask of being happy.